1.1 What Shapes Do You See? Students describe and find examples of familiar shapes. Make shape posters with the attributes to each shape to refer to throughout the unit. They fill in the outlines of Pattern-Block Fill-Ins with pattern-block shapes, and record the number of each shape and the total number of blocks they used. Students find different combinations of shapes to fill the same outlined shape. They create their own pattern-block designs by using a set number of pattern blocks. In a version of Quick Images, students draw and describe shapes. Math Workshop continues to focus on composing and decomposing shapes in a variety of ways. The session ends with a discussion about counting pattern blocks. Students find as many different ways as they can to compose the rhombus, the trapezoid, and the hexagon, using pattern-block shapes. They discuss the largest and smallest number of blocks they can use to make the hexagon. Students fill an outline with pattern blocks in three different ways, using their knowledge of how to compose and decompose pattern-block shapes. They discuss how to fill the same outline with the smallest and largest number of blocks. 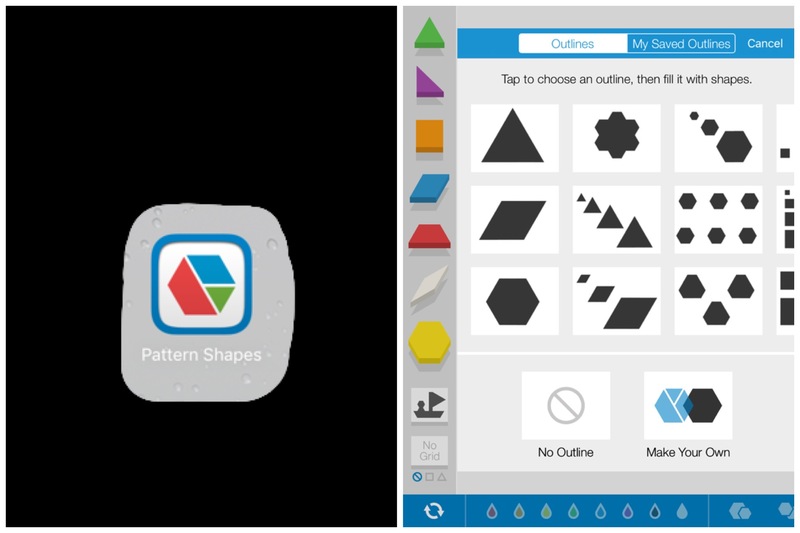 Pattern Block App - Can be used on the iPad or Computer. Students can fill in an outline in this app or create their own outline for them to fill using different shapes or for a friend to fill in. Students continue to develop visual images and language for describing shapes as they do Quick Images with shapes and combination shapes. Students are introduced to a new software activity, Puzzles. During Math Workshop, students fill in outlines of shapes first with a few pattern blocks and then with many blocks. They also explore Geoboards. As an assessment, students find as many different ways as possible to fill in a hexagon shape. They discuss how to fill in a shape outline with the fewest shapes and the most shapes.